In 2017, multiple studies suggested that artificial intelligence (AI) has reached the capacity to match or exceed dermatologists in diagnosing skin cancers.1,2 Although only a single case of how artificial intelligence can be utilized within the healthcare sector, it is an excellent example of how deep learning tools are continuing to flourish in the field of dermoscopy. This article looks to summarize some of the latest applications of artificial intelligence (AI) while discussing their advantages and benefits within the healthcare system. Arguably earning the largest amount of publicity at the moment, as mentioned previously artificial intelligence in dermatology is making strides towards surpassing medical professionals in diagnosing skin cancers. This is an important step for digital health because although these deep learning tools for dermoscopy are not ready to replace medical professionals, they hold an important place in the area of clinical decision support. By using intelligent clinical decision support tools such as DermEngine's Visual Search, dermatologists are able to submit a patient's dermatoscopic image for analysis. These machine learning algorithms will then provide the most visually similar images to the patient's case along with statistics relating to risky of malignancy and top diagnoses of the visually similar cases. This holds excellent applications in the field of dermatoscopy, as it serves as a valuable tool for supporting dermatologists in their clinical decisions with visually similar images. Additionally, since Visual Search is using the latest in deep learning technology, the tool is continuously learning to enhance its results. Another valuable component of Visual Search is the ability for the algorithms to be used as an educational resource for training dermatologists, researchers, students, and skin cancer specialists alike. By providing medical experts with visually similar images from a library of thousands of pathology-labelled images, they are able to gain deeper insights to their patient cases with the potential consequence of gaining confidence in their feedback. This is especially important, as studies suggest that although the majority of medical professionals use a dermoscope, others are hesitant to utilize the device due to extensive training times. Although content-based image retrieval (CBIR) tools such do not replace dermatoscopy training, intelligent dermatology education tools are able to support the continued learning and confidence in diagnostic decisions of a wide variety of healthcare professionals. In addition to gaining support for clinical decisions, artificial intelligence is also able to produce deeper insights that would be typically challenging to discover. 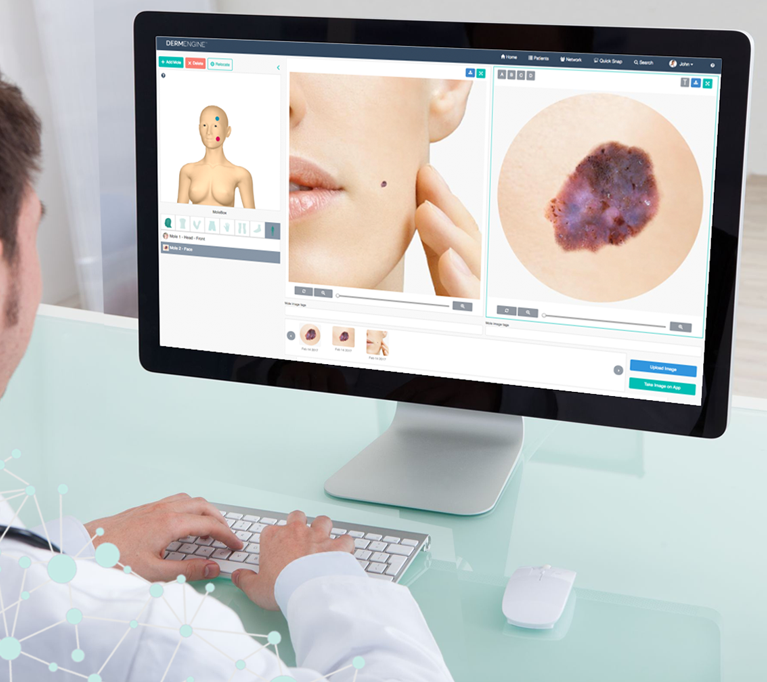 In addition to providing Visual Search, DermEngine offers a variety of intelligent tools designed to enhance analyses medical professionals make when reviewing a patient case. For example, Evolution Tracker allows dermatologists to compare images of a lesion taken over time to detect changes or monitor the healing process. When a patient returns for the follow up imaging of their case, it can be challenging to capture the image at the same angle to ensure for a fair comparison for detecting any potential changes. 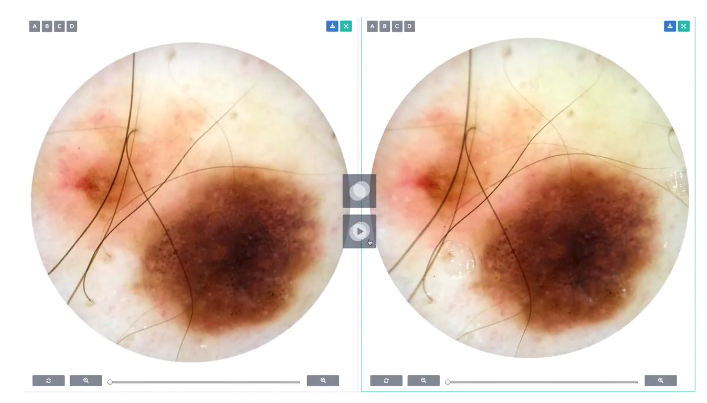 This smart dermoscopy tool will identify the lesion within each image and rotate them to the same angle to allow for quality side-by-side comparisons. Additionally, this feature is capable of playing a slideshow of the chronological images overlaid to show any changes over time. Artificial intelligence in dermoscopy has a wide variety of applications. Three of the potentially limitless applications include in clinical decision support, education, and enhanced analyses. Although intelligent dermatoscopy tools are not poised to replace medical professionals, they provide essential services to the continued improvement of dermatology and support of medical professionals for optimized patient care. Are you interested in learning more about how intelligent dermatology software such as DermEngine can optimize your practice? Sign up for a free trial to experience the latest innovations that artificial intelligence in dermatology have to offer.